Ever since the first Toyota dealership opened on October 31, 1957, in Hollywood, California, Americans have had plenty to say about the Toyota Company and Japanese cars on American roads. In 2001, when the Prius became the first mass-produced hybrid vehicle that the U.S. auto industry offered, Americans again had plenty to say about it. Decades later, the most quotable quotes about Toyota, the Prius brand, and car dealership sales in general are funny quotations from entertainers, auto experts, economists, and other famous people. 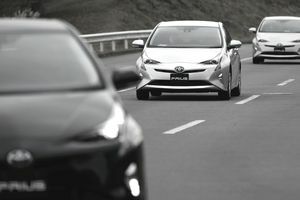 From both the hybrid advocate and contrarian objector positions come fun quotations about Toyota, Prius, and the U.S. retail car dealership buying experience. The car quotes that follow are equally shareable with Prius lovers and Prius haters, equally enjoyed by car enthusiasts and auto industry opponents, and equally understood by car buyers and car sellers who have ever set foot on a retail car dealership showroom floor.